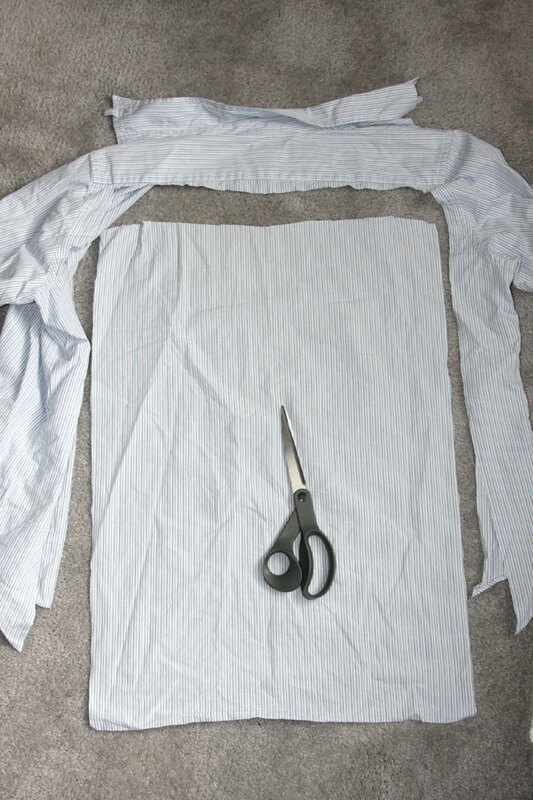 Well, it’s high time I shared another men’s shirt refashion, no? :-) Spring is in the air and I’m looking at lighter layers and breezy fabrics. 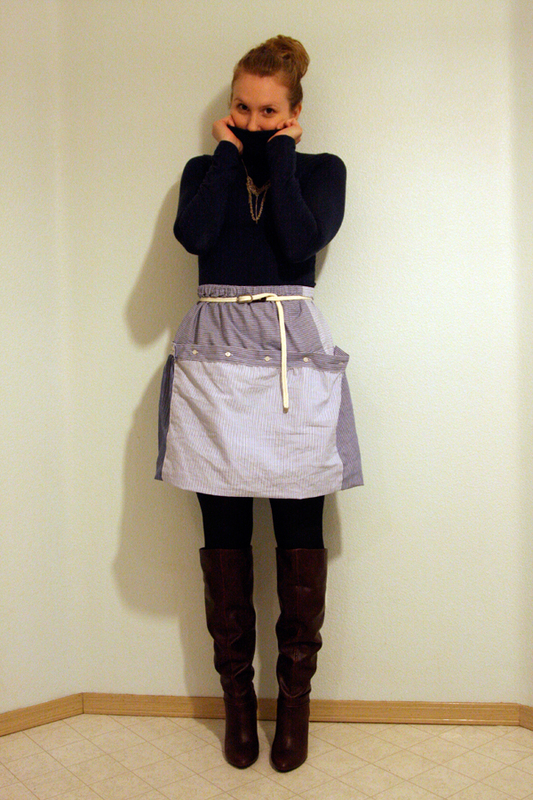 I last wore this piece on Day 15 in my 30 Days of Outfits Challenge back in November of 2010. 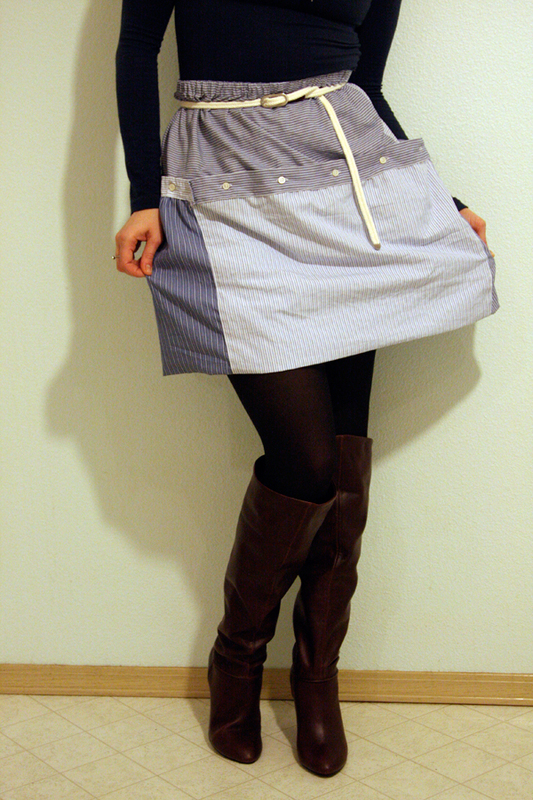 I made this skirt following the instructions from the Japanese book Kakkoii Couture Remake. I’ve written about this book before and made so many projects from it before – it continues to be such a source of inspiration for me when it comes refashioning men’s shirts. (I have changed the measurements and methodology a bit here and there to translate the project for Western sizing.) 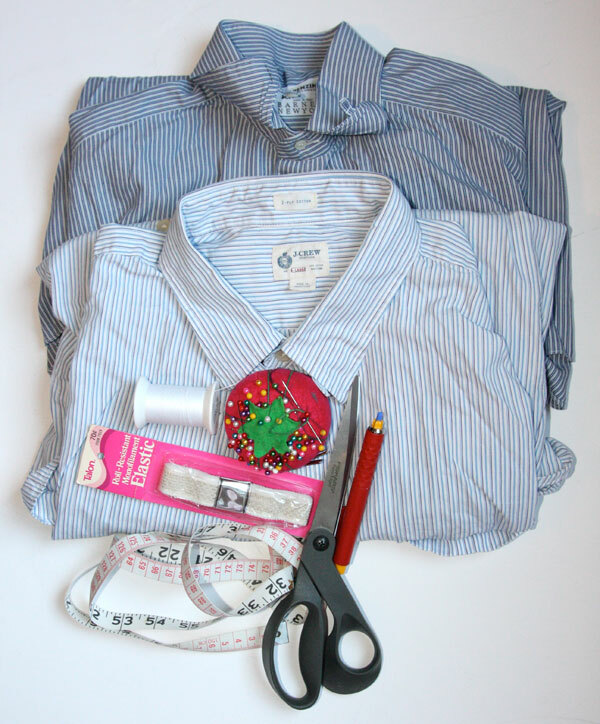 This particular project uses 3 men’s button-down shirts…which may seem like a huge waste, but if you do have a bunch of old shirts laying around, or have shirts where the arms/collars are damaged and no one can wear them anymore, or if you are buying items at 80 cents a pound from the Goodwill Outlet…then it may seem like a useful repurposing. (I used the back of a shirt I had leftover from a previous DIY, one shirt Hub was getting rid of since the cuffs were frayed, and one I bought from Goodwill.) 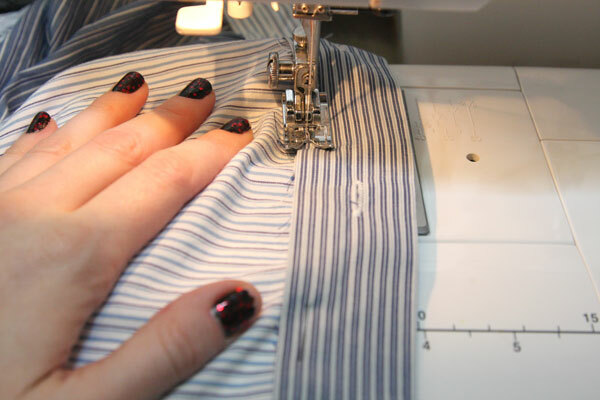 And you can obviously use black shirts or differently-patterned shirts so you can create a piece that’s more your own style or works better in your closet than a blue pinstriped piece (which is what I chose to make). 1. 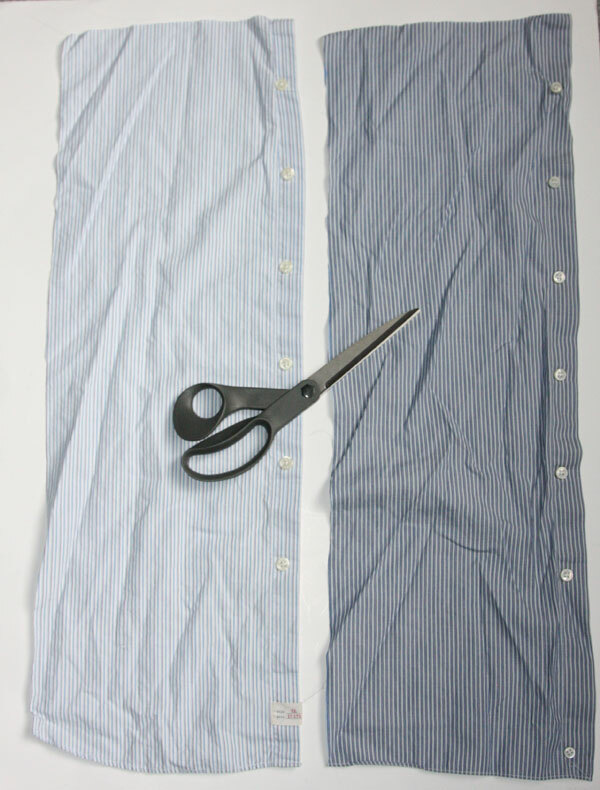 Open two of your shirts and lay them with the right-hand sides flat. 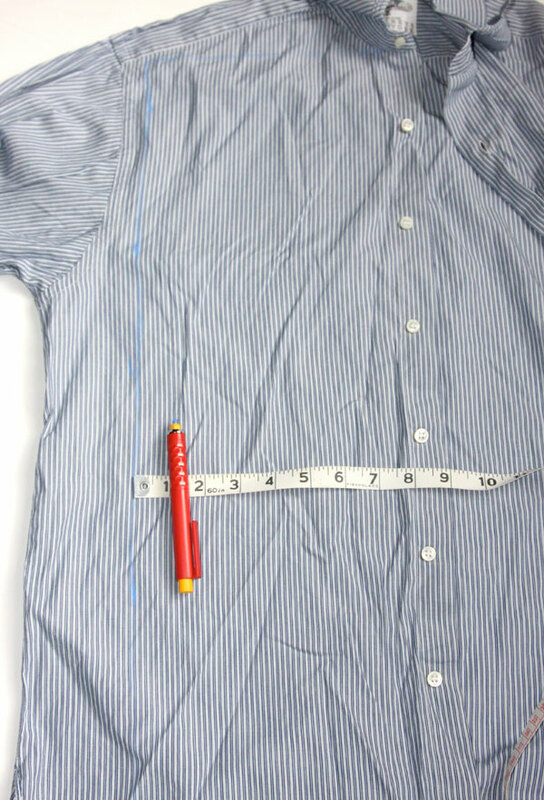 Measure a piece 9″ wide (including the button placket) by as high as you can get to make a rectangle shape on each right-hand side. 2. Cut out each rectangular piece. Also cut straight across the bottom edges to perfect the rectangle – which I haven’t shown above. 3. 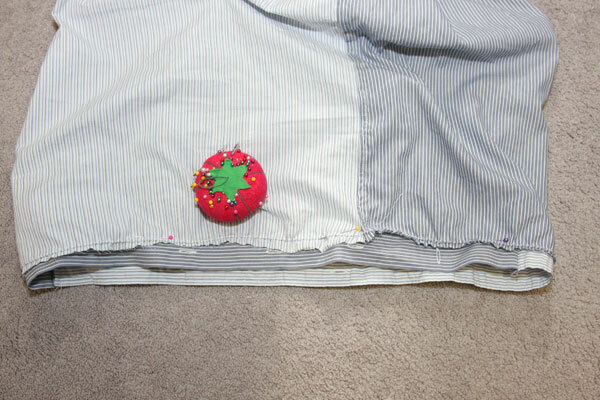 Sew the short ends of the button-side of the 2 front pieces together to make a circle. This will be the Top Piece of your skirt. 4. 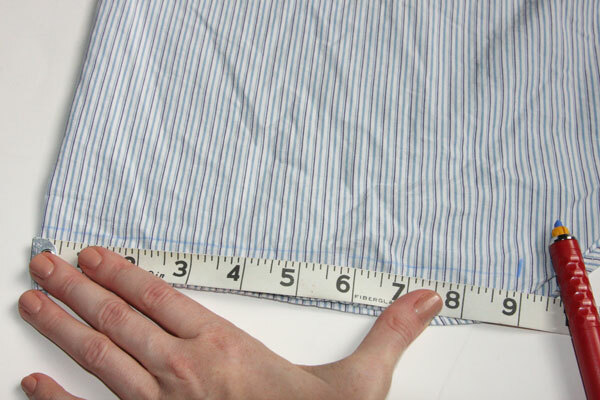 Fold the back of one of your shirts in half (vertically), and measure 9″ from the fold, in a straight line at the bottom of the shirt. Mark that line. 5. Draw straight upwards from the end of the line, as far as you can to the top of the back part, then draw another horizontal line heading back to the center fold. 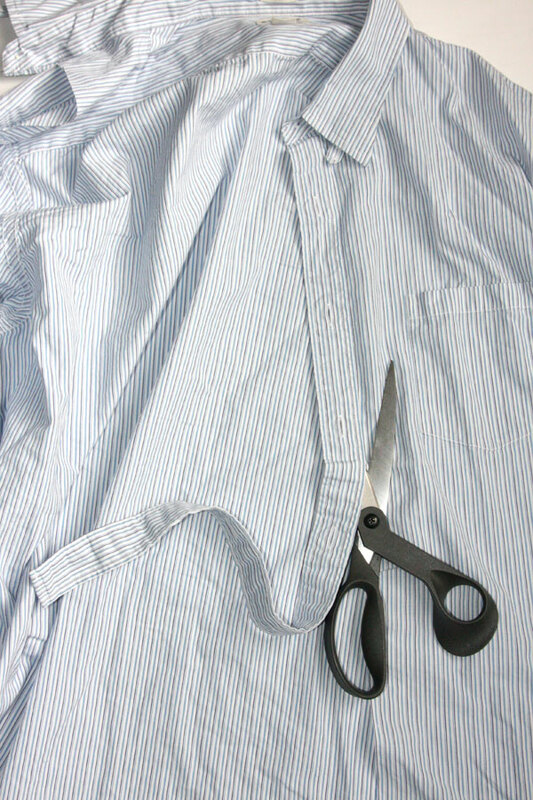 Cut – and you now have a large rectangle 18″ wide and as long as you can salvage from the back of the shirt. 6. Repeat this for the back pieces from your remaining 2 shirts. You should now have 3 large rectangles – all 18″ wide and as long as you could get from the shirts. If your fabric is super-wrinkly, now would be a good time to iron all those pieces flat. 7. 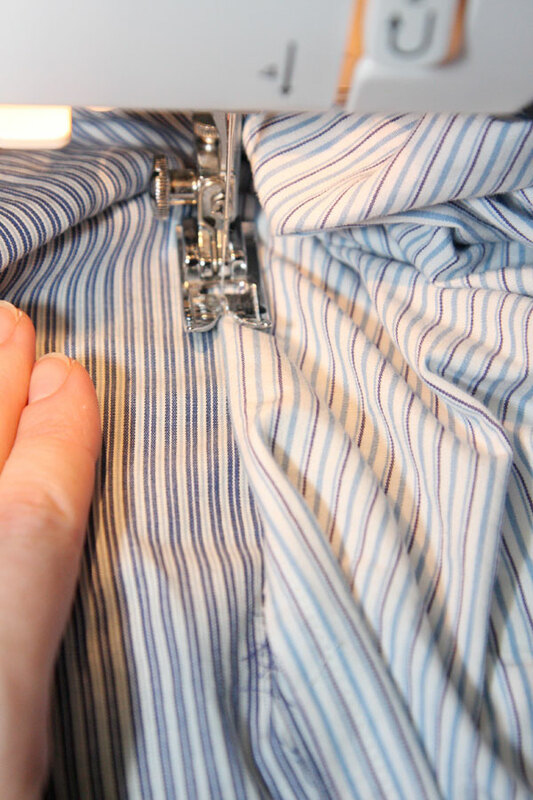 Sew the 3 rectangular shirt-back pieces together along their long ends using a French seam. Not sure what a French seam is? 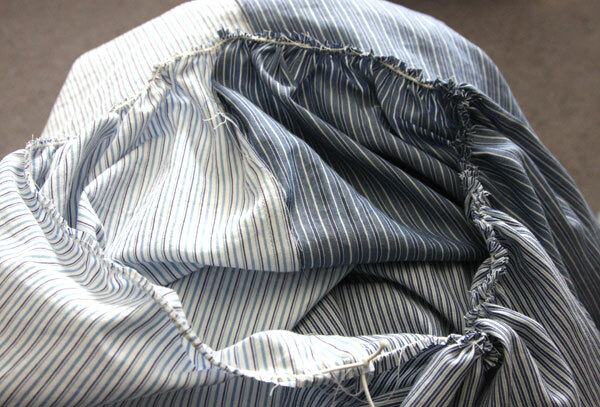 To put it simply, you place the fabric pieces wrong-sides-together and sew the seam. (So the seam allowances are on the outside of your project.) Then you flatten the seam allowances to the left, and then fold the allowances + fabric underneath them to the right, and topstitch the seam to conceal the raw edges. (You can see the fold at the top of the photo above, and my raw edges which I’m concealing as I go at the bottom.) 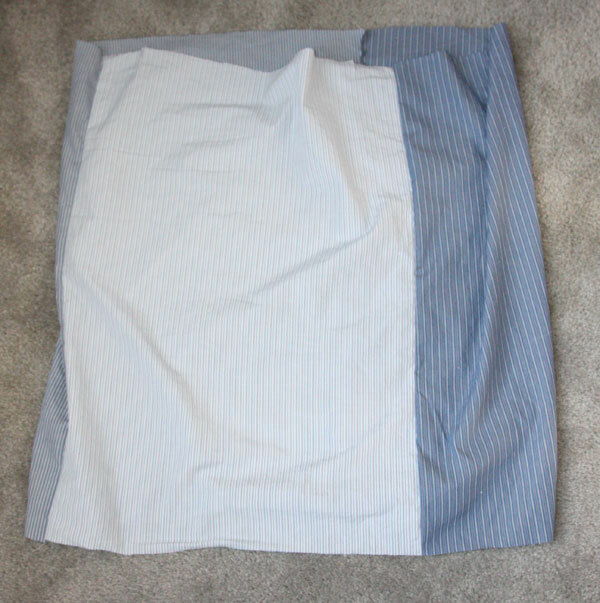 By creating French seams, this allows the skirt bottom piece to be finished completely on the wrong side as well – so it will look perfect when you flip it to the outside for the puffy bottom to the skirt. 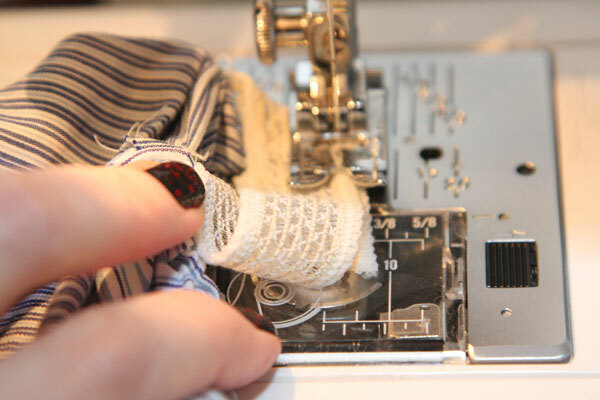 You can get the illustrated how-to instructions for sewing a French seam here. Skirt main piece finished. I trimmed across the raw edges to straighten them. 8. To size the skirt Main Piece to fit with the Top Piece (which isn’t quite as wide), zigzag-stitch over a piece of elastic cording (with one end knotted) – onto the underside top edge of the skirt Main Piece. Keep the stitches loose and make sure they go over the cord and don’t catch any part of the cord in the needle. 9. Pull the cord to gather the fabric of the skirt Main Piece. Pull the cord until the circumference of this piece is about the same as the circumference of the skirt Top Piece. 10. Pin the skirt Top Piece over the Main Piece – overlapping enough so you can stitch above the buttons and catch the skirt Main Piece beneath. 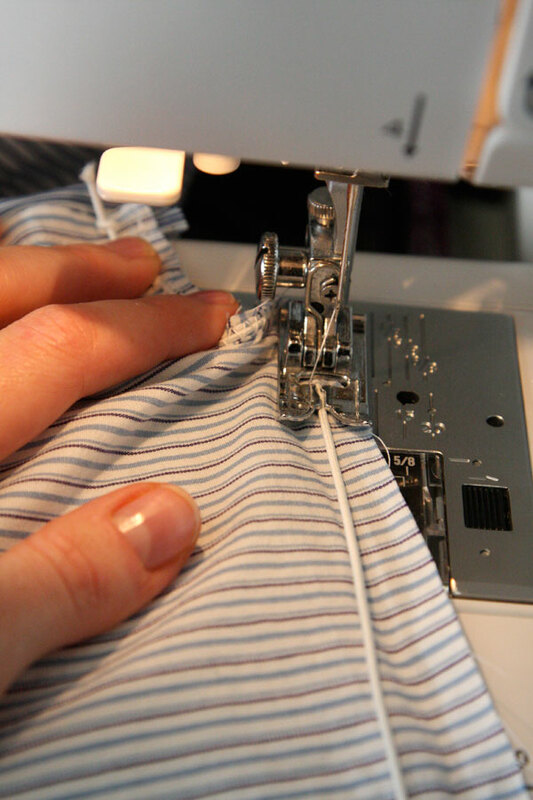 Stitch, following the seam of the button placket (but not through the elastic cord at all). 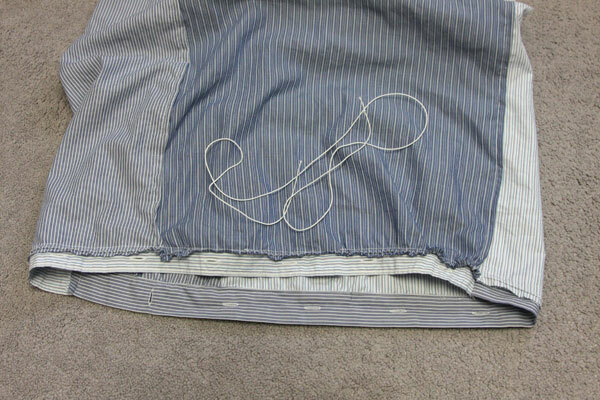 Remove the elastic cord by pulling backwards on the knotted end. Both the pieces of the skirt are now attached! As you can see, there is subtle gathering where the Main Piece meets the Top Piece. 11. 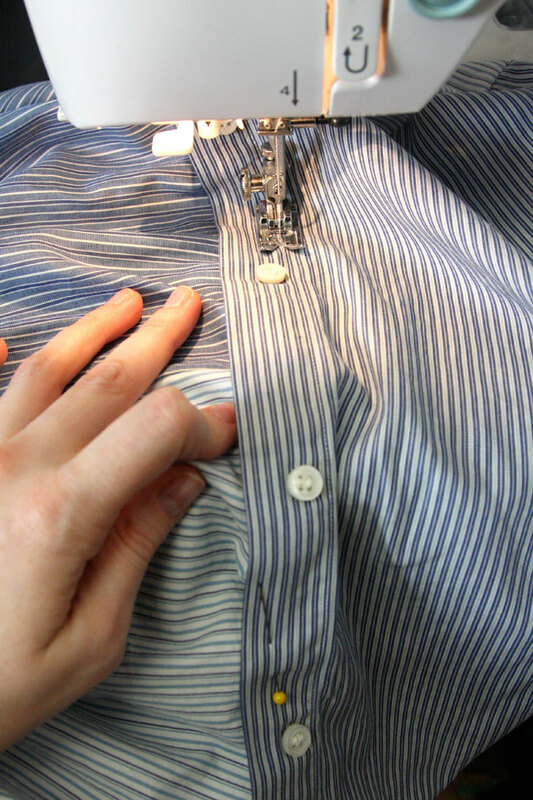 Cut off the left-hand buttonhole placket from 2 of your shirts. 14. Re-use the piece of elastic cord you used in Step 8), and zigzag-stitch over it at the bottom raw edge of the skirt. 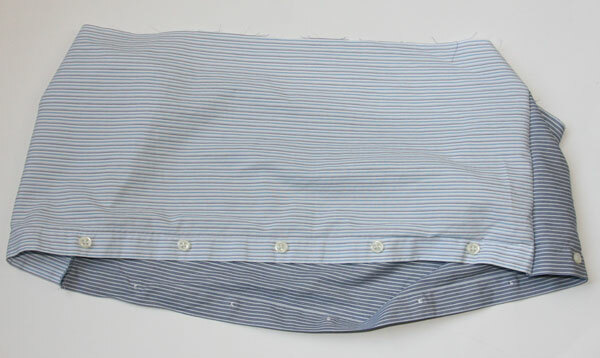 Pull on it to gather the bottom hem of the skirt so it is the same size as the buttonhole placket circle piece. 16. Topstich the buttonhole placket on top of the raw edge hem of the skirt (do not stitch through the elastic cord). Again, I followed the line of topstitching of the placket that already existed. 17. 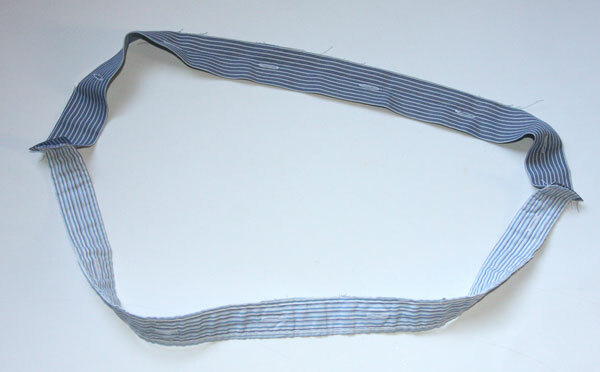 Remove the elastic cord by pulling on the knotted end and slipping it out from under the zigzag stitches. 18. 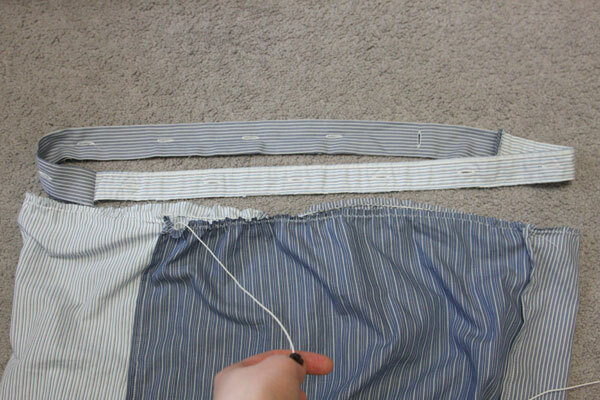 To make skirt casing for the waistband elastic, fold the top part of the skirt under about 1/4″, and then under again about 5/8.” Stitch to create casing. 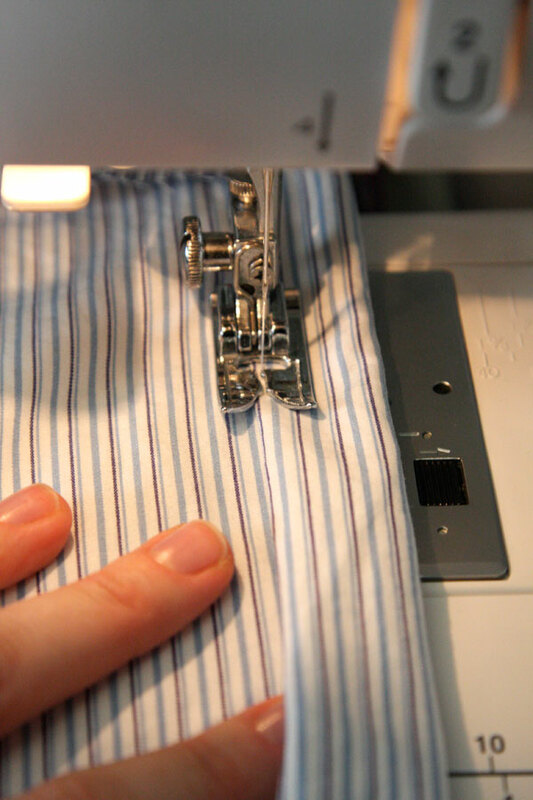 (If holding down the double fold is too tricky, you can always fold down 1/4″ and stitch, and then fold down 5/8″ to be really precise and neat.) 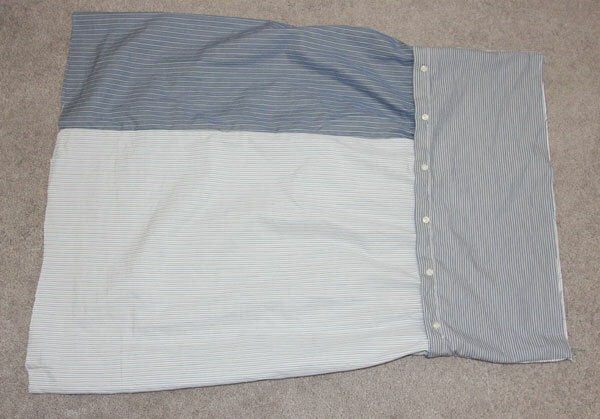 Leave about 1″ unsewn so the elastic can be added. 19. 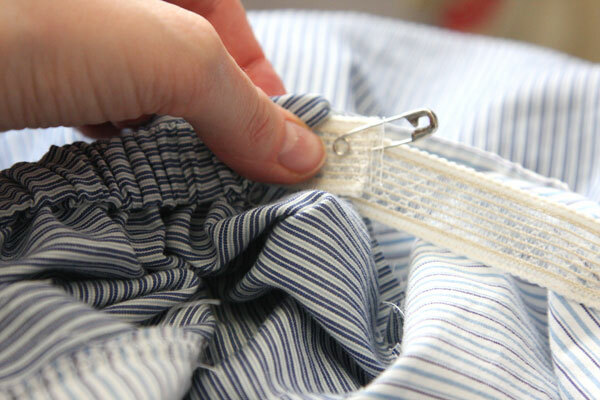 Measure your elastic by place it at your waist, and cutting it where the ends meet. 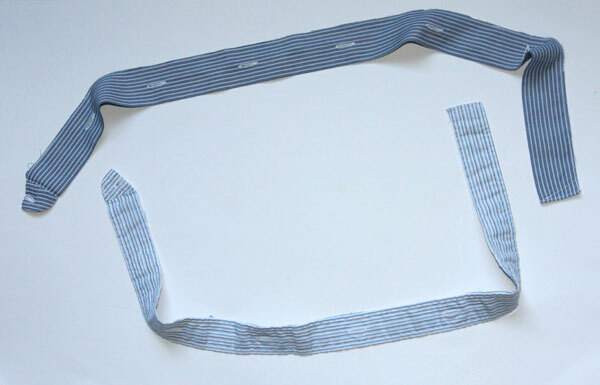 (You’ll be overlapping the ends about 1/2″ when sewing, which will create enough tension to keep the waistband in place once finished.) Attach a safety pin to the end of your elastic piece, and thread through the casing from the 1″ opening you left in the previous step. 20. Overlap the ends of your elastic by 1/2″, and stitch over them, making a rectangle with an X through the center for strength. 21. 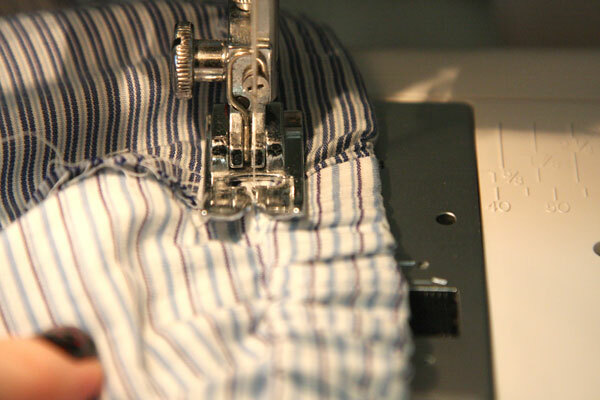 Slip the elastic ends inside the casing, and topstitch the 1″ gap to close. cool!! i looove your diy!!! 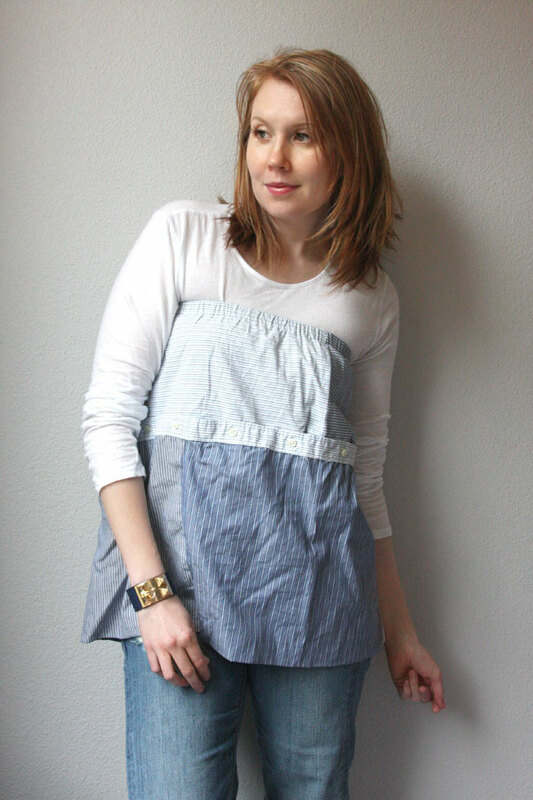 like this – so cool, looking forward to making it and adding a apron look to it. wish me luck. Thanks for the skirt idea. Great D.I.Y.! 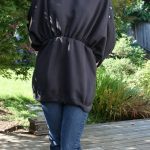 I like that it can be worn four ways, but like you, I often find that with these “convertible items” some of the ways to wear them are kind of hard to pull off (and as a short person, I have not even attempted anything midi length-I am in the habit of hacking off most of the things I thrift that fall into that category). This piece has kind of a nautical feel to me; I think it would look great styled for summer with a pop of red somewhere or maybe some espadrilles. Maybe some readers who do this D.I.Y. could share photos of their finished products, I’d love to see what other patterns people choose! That came out great and your steps are so well explained. Thanks for all the time you put into this, I’ll be linking. And congratulations on the article mention, I loved it! Fantastic and so original. 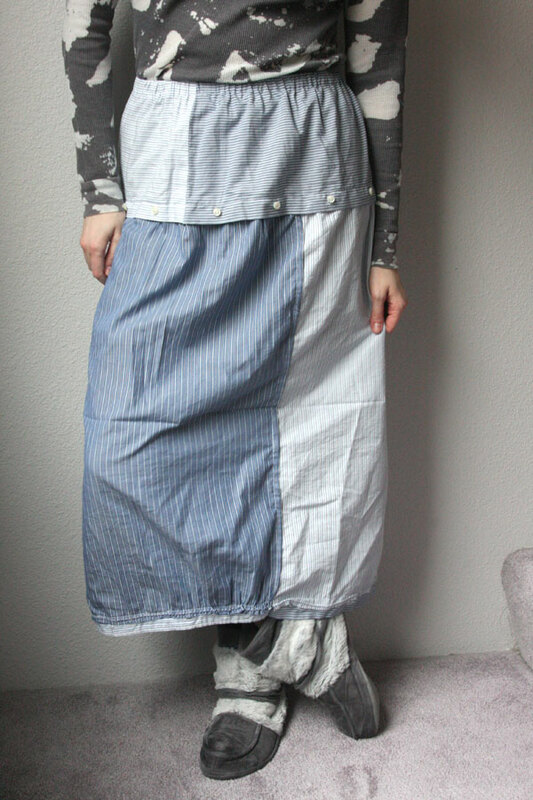 Love the way you reused the buttons to make a convertible hem. Very Creative! The skirt looks lovely! Hello Carly, you’ve got cool idea on your blog. Anybody would love to get tremendous stuff at a low price. Thanks for this tutorial, I’m moved! Hands down, best interpretation of this DIY I’ve seen. I totally wasn’t expecting something so cute and versatile.